"I will be as harsh as truth and as uncompromising as justice. On this subject, I do not wish to think, or speak, or write with moderation. I am in earnest. I will not equivocate, I will not excuse, I will not retreat a single inch and I will be heard. " The FGC is a way of life. Creating a fighting game community is not an easy task. Building one takes time and patience, riding tandem to the devotion you have for the fighting game. It's almost been one year since the LML Smash 4 community kicked off and I believe we have a very strong flame burning, having upwards of 20 familiar faces in the loop. I suppose the question that ought to be asked is why people would want to be involved in a fighting game community. By the nature of tournament, there can only be one winner (unless you're playing doubles, in which case there are two.) So what keeps these communities alive? Four things: Passion, mechanical ability, willingness to learn, and mental toughness. It is not innate. People will play games for fun and people will play games competitively. Perhaps you haven't yet discovered your passion for the game. On the other end, maybe you've been playing without a genuine passion for the game - that's okay too! The game was meant to be played and here you are, playing. Whether you follow fighting games on a pro level or simply at your local, there is a common ground for players who are passionate about the same game. We all want to see everyone do their best. Players playing at their best increase competition. Increased competition makes for better games. Better games make better players. This process keeps going week to week. Don't get complacent because the person you've been beating consistently is going to learn the match-up and catch you sleeping. To create an attractive fighting game community, you need to have this drive. Even if your tournament turnout is relatively small, the one thing that you absolutely CAN be responsible for is the amount of work you put into the game, making yourself better and, in turn, making the community better. Don't sleep on anyone and ALWAYS look for ways to improve. 1.) Learning your character. Get into training mode and learn what your moves do. Don't 'kind of' know what they do, or worse, convince yourself that you know the ins and outs of your character when in reality you're just scratching the surface. Ask your friend to help you apply something new you've learned in friendlies. Use the resources in your community. 2.) Learning Match-ups. The ongoing struggle. If you have a declared 'main' in any fighting game, you're going to have to learn how to fight against a bunch of different characters. Identify ways you can use your character to punish another characters' wiffed attack. A lot of player improvement happens here. 3.) Learning your opponent. Whether it be a weekly or regional tournament, putting yourself out there is the way of the game. Play friendlies. Keep meeting the same person at your local? Learn their patterns relative to the match-up. Where are they exposing a weakness? There's a reason why players can be divided into categories of "brain" and "heart". Cracking this player code is incumbent upon how well versed you are in steps 1 and 2, as well as your ability to adapt here. This is the point where you should be asking yourself ,"Am I applying these steps towards my improvement in X game?" You should be. It begins and ends here. Does your community have a night devoted to friendlies? If so, you sure as hell better be taking advantage of it. This is your chance during the week to put everything you've been working on to the test against other players in your community. Don't show up looking for a 1 on 1 lesson (unless you planned with someone beforehand, in which case you should probably bring a setup!) You should be trying to get games in with as many people as you can, finding your areas of weakness, as well where you're improving. You can already think of someone or several people who simply will not take advice. They either get the infamous fighting game salt, or they're stubborn to apply new ideas into their concrete play-style. The problem here is that everybody learns differently. It can be very easy to be a top player at your local who continues to dump on the middle and lower parts of the pack. In the fast-paced fighting game, it can be difficult to apply what you're learning against someone who's already been there. Keeping tension down when you're getting bodied can be difficult. Here lies the issue: nobody is going to hand you the key to success. As important as it is to note how people learn differently, it's equally as important to note that people will teach differently. You have to ask for help to receive help. It's a fragile state of learning. Nobody will teach you how to beat them, that would be silly. At the same time, it can be extremely difficult to teach in a competitive environment. Each player is focused on gaining ground during the match. Keeping your cool and reflecting on the match is your best bet. Saving replays or watching the VODs from a tourney stream are options, too. It's also good to note that players who are losing in tournaments have an edge on the top players. Say that you have a group of people who only play together, eventually the lower seeded players will catch up because they have their higher seeded players to learn from. The best of the group won't see as much improvement in the same period of time because they have nobody who's giving them a run for their money. Losing is an opportunity to learn, you can take it or leave it. Simply put, nobody is going to make you put the work in but YOU. You have to be your number 1 supporter if you want to be competitive. You need to understand what went wrong and be humbled by what caused you to lose. Not only that, but you need to hold your losses. You didn't lose because X character is top tier and yours isn't. You lost because you put yourself in a position where you did not respect your opponents options. Things get complicated here as the neutral game sometimes feels like a giant gamble, but there would be absolutely no drive to play competitively if the game was solely based on luck. Getting into any fighting game community can be freakin' terrifying. There are plenty that have been known to be toxic and unwilling to help new players. That has not been the case here at LML. 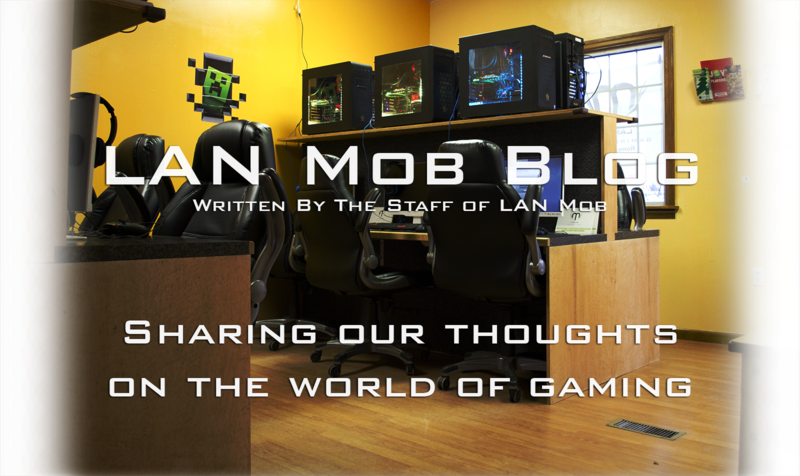 If someone new walked into LAN Mob asking about our Smash 4 scene, I would ask them what fighting games they had played and if they had been apart of any fighting game communities in the past. It would be disingenuous if I were to make it seem that being a part of a FGC was an easy thing to do. But that's just it, when someone is looking for a fighting game scene that is fostered by your venue, they like to hear that it's competitive. That means it is not inactive. I would encourage that person to come to Tuesday night friendlies! I would also ask them to play a few friendlies and be prepared to answer questions about the game. I'm fortunate to have been surrounded by the group of players that I've met this last year because they're the ones who have prepared me to help somebody get into smash 4.